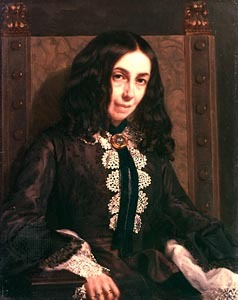 Elizabeth Barrett was born on 6th March 1806 in County Durham, England to Edward Barrett Moulton Barrett and Mary Graham Clarke. Together Edward and Mary had 12 children and Elizabeth was their eldest of all siblings. All the children, except one, lived up to adulthood. Elizabeth was mostly tutored at home and she quickly learnt languages like French, Greek, and Latin. Elizabeth’s parents were supportive of her early writings and she wrote her first collection of verse, The Battle of Marathon at the age of fourteen. Her first independent publication was in 1821 for The New Monthly Magazine. Elizabeth’s poetry was not only popular in Britain but also in America. In 1826, Elizabeth’s first collection of poems titled An Essay on Mind was published. In 1833, her translated Prometheus Bound was anonymously published. The Seraphim got critical attention and Other Poems was published in 1838. When Elizabeth was 20 years old, she fell sick but this illness proved to be a life-long ailment. The medical science could not detect her illness and thus there was no diagnosis. This led her to take morphine, which was used as a pain-killer but Elizabeth soon became addicted to it. Elizabeth because of her health would always be weak. Elizabeth never supported slavery and had even published 2 poems, The Runaway Slave at Pilgrims Point and A Curse for a Nation, which essayed the practice. Elizabeth was introduced to eminent personalities like William Wordsworth, Mary Russell Mitford, Tennyson, etc by John Kenyon, her distant cousin. In 1838, Elizabeth moved to Torquay along with her brother, Edward. Elizabeth had the closest relation with her brother. However, in 1840, he died by drowning during a sailing event. The death of Edward left a deep impact on Elizabeth and the family eventually returned to London. After her return, Elizabeth became invalid as she felt responsible for her brother’s death. In 1842, The Cry of the Children was published which focused on the issue of child labour. In 1844, two volumes of Poems was published which included A Drama of Exile, A Vision of Poets and Lady Geraldine’s Courtship. The success of the Poems published in 1844, had made Elizabeth the most popular writer. It was during this time that Robert Browning wrote to her and said that he loved her poems. Elizabeth’s famous work, Sonnets from the Portuguese and Aurora Leigh were produced after she met Robert Browning. Around the same time, Roberts Men and Women was produced. They were a source of inspiration for one another. The courtship between Robert and Elizabeth was kept a secret. They married in private at St. Marylebone Parish Church. Elizabeth’s father on learning that his daughter had been married, disinherited her like he did to his children who married. Elizabeth and Robert decided to live in Italy and led a comfortable life as Elizabeth had money of her own. In Italy, the Brownings were not only respected but were also famous. In 1849, Elizabeth gave birth to her son, Robert Wiedemann Barrett Browning. They called him Pen. Portuguese was a pet name used by her husband. Her best work includes Sonnets from the Portuguese which refers to a sonnet series of the 16th-century poet Luis de Cames and the verse-novel Aurora Leigh, the most popular of her longer poems. After the second edition of Elizabeth’s Poems was published, her popularity increased and in 1850, after the death of William Wordsworth, her name was suggested for Poet Laureate but instead it went to Tennyson. After the death of her father, Elizabeth’s health started deteriorating as there was a problem with the functioning of her lung. Elizabeth moved from Florence, Italy to Sienna and there, in 1860 she issued a small volume of political poems known as Poems before Congress. On her coming back to Italy, Elizabeth received the news of her sister Henrietta’s death. The impact of her death was such that Elizabeth was depressed and her health was weak. Her condition slowly worsened and eventually, she died on 29th June 1861. Elizabeth was buried in the English Cemetery of Florence. Elizabeth’s work carried a religious theme. Edgar Allan Poe, an American poet was inspired by Elizabeth’s poem Lady Geraldine’s Courtship. Similarly, her work was inspiring to Emily Dickinson. After her death, a collection of series of her poems was published by her husband. Elizabeth’s work includes Casa Guidi Windows, Last Poems, Aurora Leight, Poems Before Congress and many others.